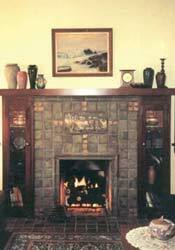 The History of Authentic Fireplaces Inc. - Authentic Fireplaces, Inc.Authentic Fireplaces, Inc. The History of Authentic Fireplaces Inc.
My Grandfather and Father were both Stone Masons and Bricklayers. They hailed from our family farm “The Longstone Farm” in County Armagh, Northern Ireland. My Grandfather taught my Father how to build fireplaces. They built fireplaces and chimneys in Ireland, England, Canada, and the West coast of the United States. In 1957, my Father met my Mother in Seattle, Washington where he settled and began our family business named “Irish Masonry”. The business built custom fireplaces and thousands of tract home fireplaces and chimneys. In 1970, our business moved south to San Diego for better weather. With the advent of inexpensive metal fireplaces and concrete, the tract work disappeared. We continued to build custom fireplaces and diversified to real estate, building income units and condos. Our family business incorporated and the new name was Longstone Construction Company, Inc. I began working in the family business in 1978. I have a Business Degree in Finance, and a Minor in Fine Arts. I graduated from Cal State Fullerton in 1985. My Father and I went into a partnership for about a year. I was raising money for a trip and studying for my California State Real Estate Brokers License. In the spring of 1986, I passed the Brokers exam. Two days later, I jumped on a plane and went around the world for a year in search of Picasso. Of course, I looked up chimneys from England to Moscow to Tokyo. I returned in the spring of 1987 and took over our family business, working closely with my mother the first several years. She has been the backbone of our family success. We are still family-owned and operated. My wife Karen and I still run our family fireplace and chimney business. I brought our business back to our roots and changed the name to Authentic Fireplaces, Inc. The focus was brought back to solely fireplaces and chimneys, because that’s what I grew up doing with my father. The scope of our work is anything from fixing a loose brick to major repairs. We also do remodeling, relining, and complete replacements. We mainly work on masonry fireplaces and chimneys. 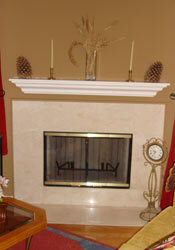 But we also remove and replace or remodel metal fireplaces. 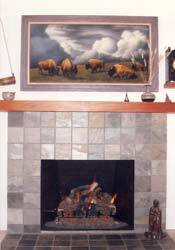 With my strong art background, my fireplaces are “Functional Art”! 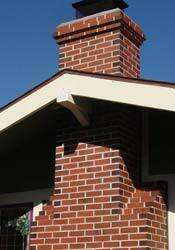 We are a fireplace and chimney service that delivers safety, quality, dependability, honesty, and fairness. We are on-the-job Fire Preventors, on the look out for unsafe conditions which can cause home fires. We do a lot of real estate inspections in the San Diego area. I believe fireplaces are function and art. 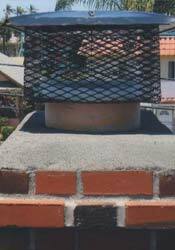 We have over a thousand pictures of fireplaces and chimneys we’ve worked on that we can show you: old fashioned brick, antique tile and replica, Spanish, southwest, stone and contemporary. As you can see, I share my family’s passion for fireplaces and chimneys. Allow me to share that with you!